Being stranded at sea can have some serious consequences. The ability to contact and communicate with search and rescue operations can be the difference between life and death in those situations. A marine VHF radio is a safety feature that you really can’t live without if you plan to take your boat out onto the water. Equipping your boat with the right radio can be something of a challenge if you aren’t sure what you are looking for. Our buyer’s guide will point out the various features and benefits of a marine VHF radio and its superiority over other methods of communication so that you will know what you are looking for before you start shopping. In addition, we have provided a review of several different marine VHF radios which will allow you to compare how the various features you learned about are integrated into their design. Armed with the information from our buyer’s guide and the opportunity to compare a number of different models, you should be able to make a well-qualified choice when it comes to selecting the right marine VHF radio to fit your needs. With that objective in mind, let’s go ahead and get started. Why do you need a marine VHF radio? Put simply, you shouldn’t leave the dock without one. Though you might take your boat out ninety-nine times without a problem, you have to be prepared for that hundredth time when a problem does arise, because that hundredth time could save a life. Besides communication, a marine VHF radio can also keep you abreast of any storm or emergency situations that might threaten your smooth sailing. If you need assistance, many of these radios can also guide rescue crews to your precise location as well. What benefits can you expect from a marine VHF radio? • Cell phones get spotty, if any, coverage on open water. • With a cell phone, you can call one person, but with a VHF radio, anyone can hear your distress call and come to your aid. That closer proximity can make a difference in many situations. • A cell phone cannot provide you with weather alerts like a VHF radio. • VHF marine radios typically include DSC features to facilitate rescue. • Cell phones usually aren’t waterproof, which is pretty important when you’re surrounded by water. For true security when you leave the dock, there is no better option than marine VHF radio. 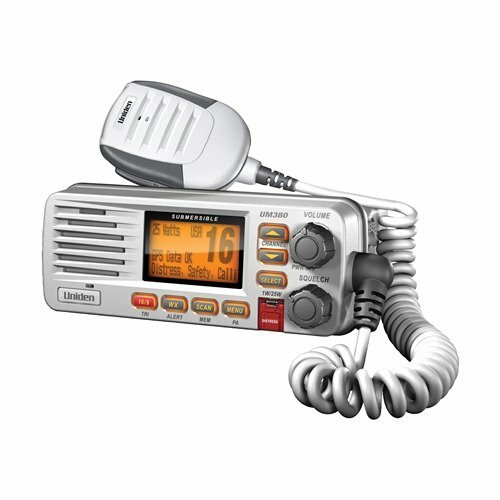 What are some features to look for in a marine VHF radio? Digital selective calling (DSC) is an important emergency feature. It has been built into all fixed-mounted radios for the past 20 years and it is also being featured in handhelds as well. With DSC, you are able to send out a distress call to the U.S. Coast Guard as well as all other DSC radios in your area with a simple push of a button. Radios equipped with DSC require a nine-digit maritime mobile service identity (MMSI) number. This number helps to facilitate search and rescue operations. Pinpointing your exact position can speed up search and rescue operations as well. A GPS not only allows you to give precise information about your location, but when included in your radio, is also transmitted along with your DSC distress call. This feature allows rescue parts to chart a direct course to your location, saving time. And, of course, it also provides you with accurate navigational information. Using an automatic identification system (AIS) receiver, you can get real-time information to locate and identify nearby vessels. This information can include type, dimensions, cargo, position, speed and destination as well as other information. With an AIS transponder, you can also broadcast that information about your own vessel. When it comes to scanning, there are a couple of features to keep in mind: dual watch and tri watch. Dual watch allows you to watch both your priority channel and a second channel while you are waiting for a signal. Tri watch is the same, except you it allows you to watch your priority channel, channel 09, and any other channel you choose. Since mariners are required to monitor channel 16 for distress calls, having this feature allows you a little bit more variation in channel scanning selection. Being surprised by a squall that just popped out of nowhere should never happen if you are monitoring the alerts from the NOAA channels on your VHF radio. Besides general NOAA alerts, you should look for the specific area message encoding (SAME) feature as well. This allows you to help pinpoint threats that are more specific to your region. There are plenty of regular noises at sea, including: rain, wind, crashing waves and engine noise. Those noises can make it difficult for incoming or outgoing transmissions to be heard. Noise canceling helps to clean up the transmission so that it can be heard with greater clarity. • IPX1: Resistance to vertical drops. • IPX2: Resistance to vertical drops whenever the unit is tilted up to 15 degrees. • IPX3: Resistance against spray up to 60 degrees. • IPX4: Resistance against splashes that come from any direction. • IPX5: Resistance against water jets that come from any direction. • IPX6: Resistance against stronger jets of water. • IPX7: Waterproof when submerged in up to 3’ of water. • IPX8: Waterproof when submerged in more than 3’ of water. Keep these codes in mind as you examine various radios in order to get the very best water resistance you can get. After all, a radio that has drowned is completely useless to you, your family and your crew. With the features and benefits we discussed in mind, you are better qualified to examine the various models of marine VHF radios reviewed below in order to narrow down your selection to the one which works best for you. 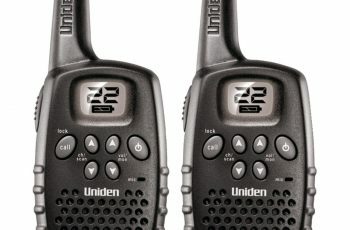 A popular handheld that is handy to take along for a backup to the fixed unit in your boat when you push off from the dock is the Uniden MHS75. This is a submersible 5 watt VHF radio with plenty of features to make it an eye-catcher. With this radio, you have all of the USA, Canadian and international channels you need along with all of the NOAA channels. This unit features a DC charger with a lithium-Ion battery and can be used in your boat’s power supply as well. It has a back lit LCD display, has dual, tri and quad watch capacity, and is IPX8 rated. It can float up to 30 minutes without damage. • This radio is a dependable backup to your mounted radio. • You get all of the channels you need, including NOAA. • This is a rechargeable unit. • Dual, tri and quad watching channel scanning are available. • The low and high wattage option allows you to conserve battery life. • This radio is submersible for up to 30 minutes without damage. • It comes with a 3 year warranty. • Its 12 hour battery life without charging leaves a little something to be desired. • There is neither DSC nor GPS provided with this radio. You need a handheld backup to the fixed mount radio in your boat. You will not have all of the features you need for complete safety with this radio. The Standard Horizon HX870 VHF Marine Radio is like putting a fixed mounted radio in the palm of your hand. This 6 watt unit includes its own built-in GPS/DSC receiver as well as a distress key transmitter. You get all channels, including NOAA, 1800 mAh Li-Ion battery is included along with both DC and AC chargers, and dual or tri watch scanning. This unit has an extra-large, backlit full dot matrix display, it is submersible, will actually float, and has durable construction. • The included features of GPS and DSC allow this radio to function as a fixed mounted radio. • Its large display makes it easier to read. • It includes a dependable rechargeable battery with long charging life. • This is a well-constructed radio with IPX8 rating. • Dual and tri watch scanning are available with this radio. • It is backed by a 3 year warranty. • The white light on the LED illumination isn’t as easy to see as an alternate color. • It is a little bit bulky and pricey for a handheld. You want a handheld with all of the features of a fixed mount radio and don’t mind paying a little bit more for it. If you are using this as a backup to your fixed mount radio, you might have a hard time justifying the extra cost. The Icomic M506 21 Fixed Mount VHF Marine Radio is a full featured VHF with an integrated AIS receiver and NMEA 2000 connectivity. This radio also includes GPS and DSC as well. You get all USA, Canadian and international channels as well as NOAA. The transmitter is 25 watts and it also includes a 25 watt manual or automatic hailer or horn option. It features active noise canceling, tri watch scanning, a large amber back lit display with full dot matrix readout, and is menu driven. Another added feature is last call voice recording, which records the last 2 minutes of the last call that came in, allowing you to listen to it multiple times for clarifying details. • This is a user-friendly radio with an easy to follow menu on a large easy to read display. • It features AIS, DSC, GPS, and NMEA functionality. • This radio has tri watch scanning. • Active noise canceling is a very positive feature. • Its 25 watt transmission capability is impressive. • It also includes foghorn and loudhailer functions. • GPS support for this unit is only allowed with NMEA 0183 interface. • The instruction manual is a bit hard to follow. • This radio is pretty pricey. You need a fixed mount radio with AIS for monitoring heavy traffic and coastal surveillance and don’t mind paying for it. The cost of this unit might be difficult to justify if you are on a budget. Another handheld option to keep in mind is the Standard Horizon HX300 Handheld VHF Marine Radio. This is a 5 watt submersible, floating radio with a recovery strobe light if it happens to get dropped overboard. This unit includes dual and tri watch scanning functions, 10-channel preset keys, and all Canadian, USA and international channels, including NOAA, are available. The radio comes with a 1650mAh 3.7V Lithium-Ion non-memory rechargeable battery and AC USB charger. Illumination for both the display and buttons are also available on this unit. • This is a durable radio which provides a clear signal and is reliable. • It is IPX8 rated, floats and activates a recovery strobe if dropped overboard. • The easy to use and easy to read menu with display and button backlighting are an added plus. • Receives all necessary channels and includes dual or tri watch scanning. • It comes with a rechargeable battery and USB charger. • There is no DSC or GPS included with this radio. • The volume and squelch controls leave a little something to be desired. You need a reliable backup to your full-featured fixed mount radio. If you desire the DSC and GPS functions and more clarity in the transmissions you receive, you won’t be happy with this radio. When it comes to top of the line fixed mount radios, it is hard to beat the Standard Horizon GX1700W VHF Marine Radio. This radio will easily install in places with a tight fit because of its compact design. It features DSC as well as 12 channel GPS with navigation and you can record over 100 waypoints in this radio as well. It has a large, easy to read display with all USA, international and Canadian channels along with NOAA. Dual watch and priority channels scanning are fully programmable, and the transmitter on this unit has 25 watt output. • The large, easy to read display is driven by fully programmable menus. • It is shock and fully waterproof. • This radio features DSC with GPS that can also work for navigation. • You can program 100 waypoints into this radio. • It has all of the necessary communication and emergency channels available. • This radio might not be as waterproof as the manufacturer advertises. • You have to purchase the antenna for this unit separately. You want a durable high-end fixed mount radio at a mid-range price. You might not be happy with the lack of some features on this unit. 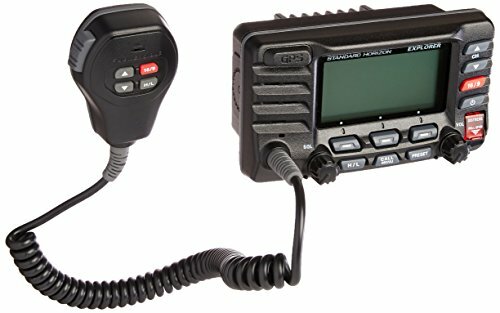 Top of the line fixed mount radios don’t get a whole lot better than the Standard Horizon GX1700B VHF Marine Radio. 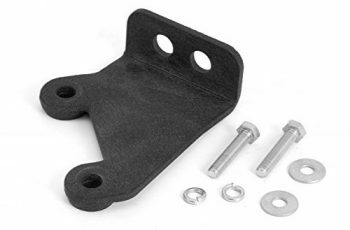 The compact design of this model allows it to be mounted in places with a tight fit. DSC is featured with this radio along with 12 channel GPS that includes navigation, and the ability to record over 100 waypoints in this radio as well. The large, easy to read display with all USA, international and Canadian channels along with NOAA is easy to read and makes the radio easier to use. Priority channel and dual watch scanning are fully programmable, and its transmitter has 25 watt output. • Fully programmable menus are easy to use on its large, easy to read display. • It fully waterproof and well-built. • DSC with GPS that can also work for navigation are included in this radio. • 100 waypoints can be recorded into this radio. • All necessary communication and emergency channels are also available. • After getting wet, the functions of this radio are limited. • The antenna for this unit must be purchased separately. You want a fixed mount radio with top end features at a mid-range price. There are some features missing on this radio that you might want to have. 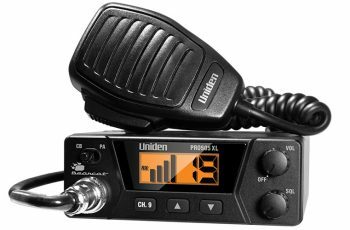 All channels including weather can be received by the Uniden UM380 Fixed Mount VHF Marine Radio. Besides national NOAA weather, this unit has SAME capacity as well as tri watch scanning. A choice of 1 watt for short range contact or 25 watts for greater range is possible with this radio as well. DSC transmissions are possible with the connection of GPS via NMEA 0183. This radio is rated IPX7 has a large display with an orange background behind black LED makes it easy to see and easy to read, and the keys are back lit as well for operation in the dark. • This unit is easy to read and easy to operate. • It comes with all of the necessary communication and emergency channels, including SAME weather. • Its NMEA interface will allow it to have DSC and GPS combination. • This unit has tri watch scanning. • This is a very affordable radio backed by a 3 year warranty. • GPS and DSC are not included with this radio and have to be purchased separately. • The range of this radio does not live up to expectations. You want a budget friendly reliable radio with GPS and DSC expandability. You might not be happy with the range and lack of features of this radio. This Standard Horizon GX2200B Standard Matrix VHF Marine Radio kicks things up a notch when it comes to high-end features. The unit includes 2 integrated AIS receivers along with an integrated GPS receiver. You get full AIS/GPS matrix display with this radio also. The transmitting potential of this radio is 30 watts and a 30 watt PA and loudhailer are also a part of the package. The larger display panel gives you extended easy to read information that is fully programmable with its user-friendly menu options. NMEA functionality is also included, as is tri watch scanning. It has an IXP7 rating for water resistance as well. • There are plenty of high-end features like GPS, DSC, AIS and NMEA on this radio. • It has plenty of transmitting power at 30 watts. • The large display makes it easy to read and program. • All communications and emergency frequencies are included with this unit. • Tri watch scanning is available. • This radio has IXP7 waterproof rating. • Though it receives AIS, it does not broadcast AIS. • The external RAM3 remote controller has to be purchased separately with this unit. You very dependable, high-quality radio and don’t mind paying a little bit more for it. You might not be happy with this unit if you need to broadcast in AIS. An affordable option in fixed mount radios can be found in the Cobra Electronics MR F45-D VHF Marine Radio. This radio has a solid transmitting range at 25 watts and it includes DSC functionality to make it an excellent piece of safety equipment. It has a noise canceling microphone to improve the clarity of your transmissions. You get dual watch scanning, the largest display on the market with adjustable level backlighting, and it is submergible. All communication channels, weather and emergency channels are available with this unit as well. 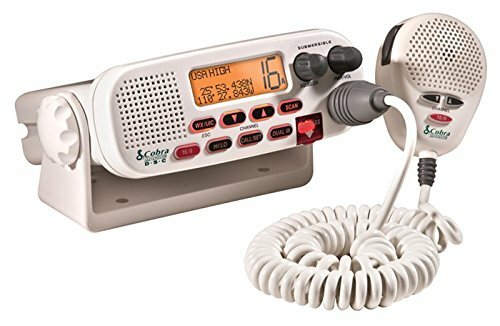 • This is a solid built affordable fixed mount VHF radio that is submersible. • It includes a large easy to read display with adjustable backlighting levels. • DSC and dual watch scanning are available on this radio. • It has solid transmitter output. • All communications, weather and emergency channels are included. • This is an excellent radio at a budget price and is backed by a 3 year warranty. • No GPS or AIS is included on this unit. • There is no vertical mounting bracket. You want a dependable radio at a budget price. If you need GPS or AIS included in your radio, you might not be impressed by this model.